I’m not going to use this space to make any playoff predictions. First of all, I’m too biased; there’s no way I wouldn’t pick the Pens. Secondly, if things go poorly, I don’t want that on my conscience. Instead, I’m going to familiarize you with the Penguins’ opponent, the Ottawa Senators. Since the Pens are going to play anywhere between four and seven games in a row against them, you might as well be informed. The Sens are making their eleventh straight playoff appearance. Last year, was the first time they made it to the Stanley Cup Finals. Of course, they lost to the Ducks, making the Senators the third Canadian team in a row to lose in the Finals. The Senators entered this season as the Eastern Conference favorite and seemed to back that up with a 15-2 start to the season. 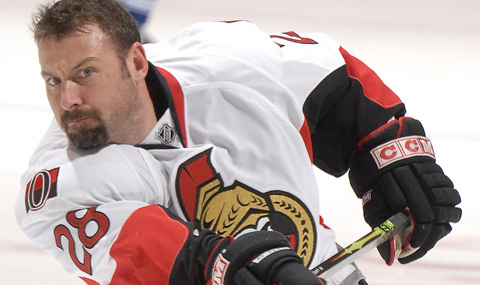 Fast forward to April – the Sens’ captain is injured and will miss the series. They’ve fired their coach, benched their goaltender because he’s more unstable than Britney Spears, and clawed their way into the playoffs during the last week of the season. Motivation: Bryan Murray, the GM and interim coach, is claiming the Penguins all but forfeited their final regular season game to guarantee a matchup with the limping Senators. Hey, whatever you need to jumpstart your listless club, buddy. Leading Scorer: Jason Spezza with 92 points in 76 games. Daniel Alfredsson follows him, but is injured because of this thundering hit by Mark Bell, whom you may recall from his DUI suspension and facial fractures courtesy of our own Ryan Malone. Public Enemy #1: Chris Neil (199 penalty minutes in 68 games). I’m sure Ruutu and Laraque will be all over him. Goaltender: The playoffs require outstanding goaltending. Pens fans will remember it was Ray Emery who backstopped the Senators during their playoff run last season. Well, Emery has gone loco, become a team cancer, and only played in one game since March 1. Martin Gerber will be the starter. Gerber’s last playoff appearance was with the Stanley Cup Champion Carolina Hurricanes, but don’t panic. Gerber started the playoffs and Canes promptly lost the first two games. He was replaced by eventual playoff MVP Cam Ward. To say that goaltending is a question mark for the Senators would be a huge understatement. Ottawa is definitely a dangerous team with experience and talent. The Penguins must take advantage of their home ice advantage to get out to a quick series lead and stop the Senators from gaining any momentum. If you’ve got tickets to Games One or Two, you better be loud… and please don’t boo the Canadian Anthem. For some reason this has become a hockey playoff tradition in American/Canadian matchups. It’s classless, especially considering our franchise’s two icons are both Canadian. Have fun, be loud, but be respectful. Let’s Go Pens! thank you koz. appreciate the info. let's go pens. Pens in 6. All 50 of us that get Versus better tune in tonight. It really irritates me when people are so classless as to boo a neighbor who has been as good to this country as Canada has been. Maybe these same idiots would like China on our border, or maybe Iran. Now that would be good. People have to start realizing that their actions...even at something as simple as a sporting event...can cause serious repercussions. Hey, we already have Mexico as a terrible neighbor to the south, let's not screw up our relationship with Canada! And finally, think about this: If you were Sidney Crosby, Fleury, Talbot, Pascal, or any of the other Canadian players on the Pens roster, how would you feel if your native country was being booed by your home crowd?